This Father’s Day I thought why not combine the two things I love to do, crafts and photography, and make Hubs a handmade gift he will love forever. 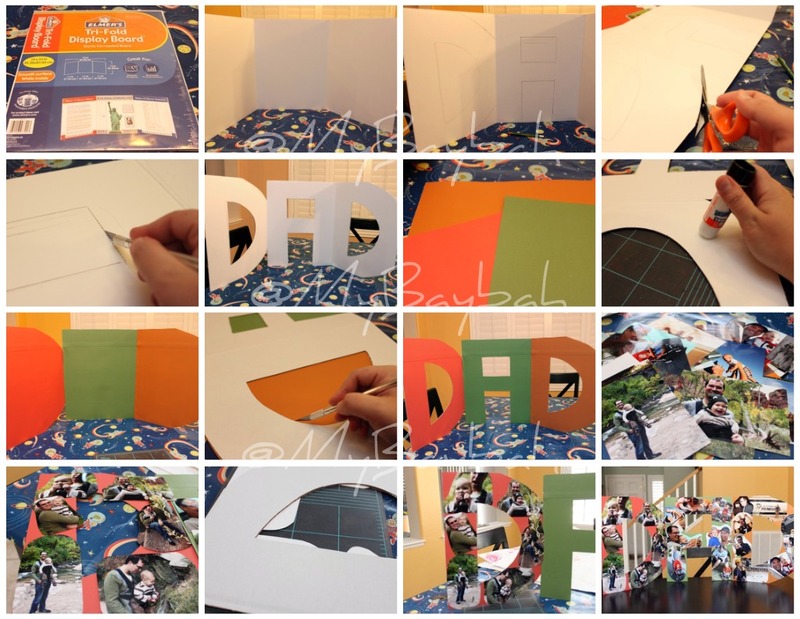 I decided to make him a Dad Collage that he could put on his desk at work, or we put on display in his art studio. I loved looking through all of the pictures from the past year of Hubs and Baybah together. Here is the end result! My Hubs loves it! As soon as he saw it he said that he wanted to put it in his classroom:) Yay! The collage displays some of my favorite pictures and memories of Hubs and Baybah from the past year. 1. Elmer’s Tri-Fold Display Board – They have different sizes, but I decided on the 14 X 33 in. 2. This is what the board looks like when it is open. I like it because the tri-fold can stand up on its. own. I like that each panel is the same size, perfect for my letters. 3. Draw the letters for DAD on the board. One letter for each panel. 4. Cut off the extra pieces. 5. Use an X-Acto to get the tricky spots. 6. Open up your board, and it will says DAD! 7. Decide on the scrapbook paper colors you would like to use. I chose a different color for each letter. 9. Lay your scrapbook paper on each letter. 10. Cut off the excess with scissors and an X-Acto. 11. Looks good, but I think it needs some pictures to give it life! 12. Pick out your favorite pictures of your Hubs and kid/s. If you had 3 kids, it would be so cute to dedicate one letter per child. 13. Cut your pictures to fit the letters, and glue them on top with the X-Treme glue. 14. Turn it over, and trim off the excess with your X-Acto. 15. After you finish one letter, start the next. This would also be fun for Grandpa too if you call him Pop! Happy Father’s Day! Disclosure: This project has been compensated as part of a social shopper insights study for Elmer’s #gluenglitter #collectivebias. All thoughts and opinions are my own. It came out great!! I love that it can stand up on its own, without support. What a great gift idea! very nice!!! I will for sure have to try this next year when i can trust my kids with glue! Absolutely fantastic project. I love it! This is a great idea – but I am intimidated by the “Cut the letters out! !” I’ve never been great at the cutting part – lol… Love what you did! Such a special gift. I am stopping by from the WhipperBerry Friday Flair where I’ve also linked up, pop on by if you get a chance.